WTOP's voter's guide provides a glimpse at some of the key races and helpful information for voters in Maryland, Virginia and D.C. to make their choices Election Day. WASHINGTON — After months of campaigning, contentious debates and nonstop political ads, voters will get their say at the ballot box Nov. 8. While the presidential contest between Hillary Clinton and Donald Trump has dominated the airwaves and newspaper headlines, there are plenty of other issues on the ballot — from competitive local races to ballot initiatives. WTOP’s voter’s guide provides a glimpse at some of the key races and helpful information for voters in Maryland, Virginia and D.C. to make their choices Election Day. In Virginia, voters will decide a slew of congressional races — only Rep. Gerry Connolly, D-Fairfax, is running unopposed among the state’s 11 districts. First-term Republican Rep. Barbara Comstock is locked in a tight re-election fight against Democratic challenger LuAnn Bennett, a D.C.-area real estate developer. Voters in Fairfax County will be asked to approve a four percent sales tax on restaurant meals and prepared food and beverages, part of a county plan to provide millions in additional funding for the school system and property tax relief. In Arlington County, voters will weigh on a $139 bond initiative for school construction and a $58.8 billion bond to fund Metro capital improvements. Read more about competitive Virginia races here and about the ballot issues here. Polls in Virginia are open 6 a.m. to 7 p.m. on Tuesday. The Virginia Department of Elections encourages voters to arrive early, but says as long as voters are in line by 7 p.m., they’ll be allowed to vote. You can look up your polling place on the Department of Elections website. 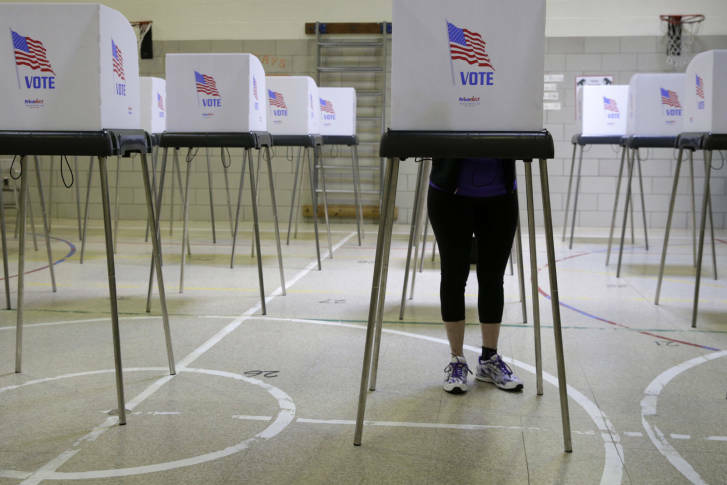 Virginia law requires voters to provide a photo ID before they vote. Voters without proper ID on Election Day can still vote using a provisional ballot, but will have to provide a copy of their ID by the Monday following the election in order for the ballot to be counted. Ballot selfies are legal in Virginia, according to a legal opinion issued by Virginia Attorney General Mark Herring. Virginia law does not prohibit voters from taking pictures of themselves, their ballots or even fellow voters in a polling place. You can bring your child into the voting booth. The child must be 15 or younger. Virginia does not have early voting, but does allow in-person absentee voting if voters have a state-approved excuse. In-person absentee voting ends Saturday at 5 p.m. Read more about in-person absentee voting here. If you’re voting by mail, your absentee ballot must be received by your local registrar by 7 p.m. on Election Day. In the District, voters will decide whether to return former Mayor Vince Gray to the D.C. Council, whether at-large council members David Grosso (an independent) and Robert White (a Democrat) will keep their seats and whether to approve city leaders’ plan to push the U.S. Congress to make D.C. the 51st state. Read more about what’s on the D.C. ballot here. Polls in D.C. open Tuesday at 7 a.m. and stay open until 8 p.m.
You can search for your polling place on the Board of Elections website. D.C. allows same-day registration during Election Day and early voting. Voters will need to bring proof of residence, such as a current government-issued photo ID or a copy of a current utility bill, bank statement or paycheck that shows the voter’s name and address. In D.C. you may bring your children with you, but they must not disrupt the voting process. Ballot selfies? D.C. elections officials might discourage from taking photographs, but they won’t try to stop you, according to a Board of Elections spokeswoman. Early voting in the District ends Friday at 7 p.m. Voters can vote early at any location. Find a list of early voting locations, hours and wait times here. Already, a record number of D.C. residents have voted early, according to the D.C. Board of Elections. As of Wednesday — two days before early voting closed — about 69,000 D.C. residents had voted early, surpassing the approximately 57,000 who voted early in 2012. If you didn’t request an absentee ballot by Nov. 1, it’s too late now. Your filled-out ballot must be received by the board of elections by 8 p.m. on Election Day. You can track your absentee ballot here. When Maryland voters head to the polls, they’ll select a successor for longtime Democratic Sen. Barbara Mikulski, who is retiring. Republican Kathy Szeliga, a member of the Maryland House of Delegates, is facing an uphill battle against Democratic Rep. Chris Van Hollen for Mikulski’s seat. Voters in Montgomery County will consider a ballot question on setting term limits for members of the county council. Read more about some of the competitive Maryland races here and about the ballot issues here. In Maryland, polls are open between 7 a.m. and 8 p.m. You can find your polling place here. You may bring one or two children under the age of 18 with you to the polls. Early voting ended in Maryland on Thursday. More than 730,000 voters in the state cast an early ballot — compared to 430,500 in 2012. The deadline to request an absentee ballot by mail was Tuesday. If you want to download your ballot from the state website, the deadline is Friday. Absentee ballots must be hand delivered to your local board of elections by 8 p.m. on Election Day. If you mail your ballot, it must be postmarked by Election Day and received by your local board by Nov. 18. You can track your absentee ballot here. Remember — put your phones away in the voting booth. Maryland law bans electronic devices in polling places and specifically prohibits photographing ballots that show a person is voting.